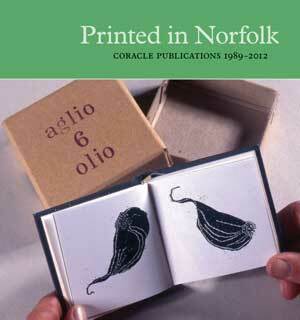 Here is the cover for the exhibition catalogue for Printed in Norfolk, Coracle Publications 1989-2012. The catalogue has been designed by long-term Coracle collaborator, Colin Sackett and includes articles by Coracle director, Simon Cutts, writer, poet and critic John Bevis and an introduction by Andrew Wilson, Curator of Modern and Contemporary British Art at Tate Britain. The cover image is of Aglio 6 Olio, or The Garlic Book – an abstract cook-book whose structure emulates that of a symmetrical head of garlic. The six cloves, each a section of the whole book, each present a recipe for one of the classic sauces of garlic and oil, plus one, or at the most two, other ingredients. even with substantial gear, and knows how to navigate between waves. Quote on the back cover from Roger L. Conover, Executive Editor, MIT Press. This entry was posted in Catalogue by helen. Bookmark the permalink.